European royalty at its finest, Portugal wears its golden crown with pride. A wondrous world awaits within its five fantastic regions and idyllic islands – where each lovely location brings something special to the holiday table. Once you've had your first taste of this heavenly holiday cocktail, you won't be able to get enough! Locals are some of the friendliest in all of Europe, so don't be surprised if you're greeted with a 'hello' and welcoming smile while simply walking down the street. 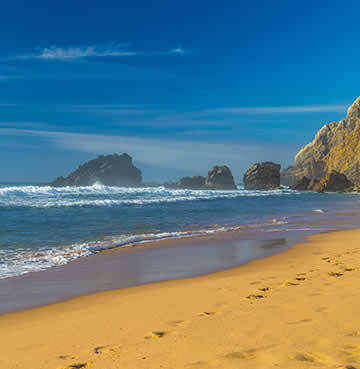 Between unbeatable beaches, enchanting coastlines, world-class golf courses and breathtaking natural beauty, there's no going wrong with a Portugal holiday. Breathe in fresh, country air in captivating Costa Verde. 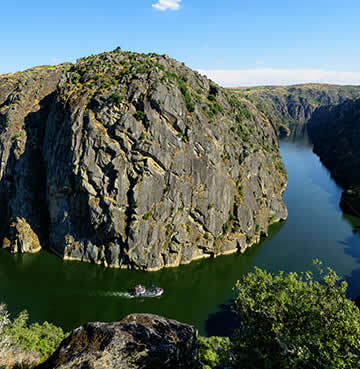 Drink in dramatic views and delicious wines among the velvety hills of Douro Valley. 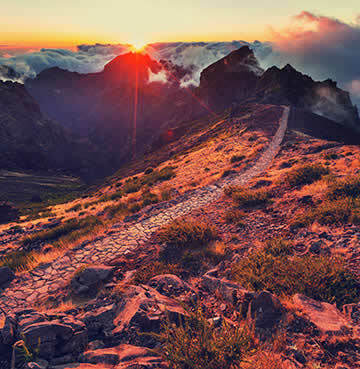 Get swept away in the sub-tropical beauty of magical Madeira and its mind-boggling mountains. 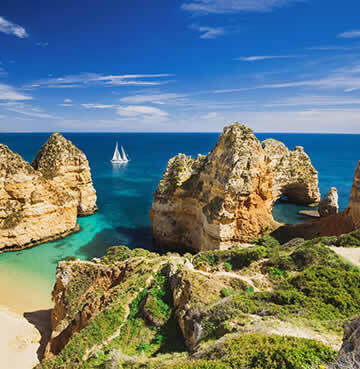 While families chasing sun, sea and splash can choose between Algarve's golden shores of the Atlantic's Silver Coast. Promises of blue skies and plenty of sunshine makes Portugal a year-round holiday haven. The southern shores welcome the warmest weather, while the Silver Coast enjoys cooler climes for outdoor adventures. 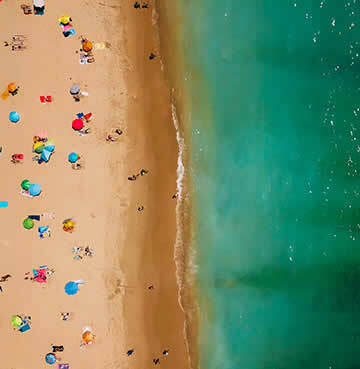 Averages in the Algarve hit 28°C and counting in the peak summer months, perfect for beach lovers seeking sun, sand and sea! Whether you're an outdoor enthusiast of bona fide beach bum, there's plenty of itinerary possibilities to be found in the sun-soaked paradise. Go from topping up your tan on pristine sands to hiking nature trails in the Peneda-Gerês National Park, and discover the beach is just the beginning when it comes to Portugal holidays! Portugal's golden paradise, there's a good reason the amazing Algarve features so highly at the top of most people's travel bucket lists. Beach lovers won't do better than these captivating 24 carat coves, cocooned by craggy cliffs and soaked in sunshine. Watersports facilities are waiting in the wings for thrill-seekers, while secluded sea caves are ripe for adventure from intrepid explorers. It's not all sand and sea, even in one of the world's most notorious beach destinations. History buffs will stumble across ancient kingdoms and medieval castles scattered throughout the rolling countryside. The red sandstone castle of Silves is one of the most famous, so be sure to stop by this marvellous Moorish creation. Culture vultures and art appreciators will find all their dreams come true as they step inside the charming churches of the Algarve. Consider the 'don't judge a book by its cover' statement officially settled, because their modest exteriors don't give a thing away. Hand-painted tiles accessorise every inch of wall space – from floor to ceiling. The 18th Century São Lourenço Church is a firm favourite for many visitors, with its dazzling blue and white azulejos (tiles) stealing the show. A stunning sub-tropical speck in the Atlantic – just shy of 1000km from Portugal's mainland – lies magnificent Madeira. Bursting at the seams with wild natural beauty, the luscious landscape is blanketed by a kaleidoscope of beautiful blooms. While Madeira can't lay claim to the same coastal credentials as the Algarve, it takes the title when it comes to towering mountains and soaring cliffs. If you're a fan of adventure and the great outdoors, this idyllic island is your ticket to holiday heaven! Levadas criss-cross the island, guiding you through stunning scenery and enchanting forests. The man-made channels were used for water irrigation, but visitors very often use the amazing aqueducts for exploring! If hiking is too slow-paced for your tastes, there's always mountain biking, canyoning, or off-road jeep tours to satisfy your thrill-seeking needs. The bustling capital of Funchal is a second-to-none sightseeing city. Nestled in a natural amphitheatre, you'll find monuments and museums between mountainous backdrops and botanical gardens. 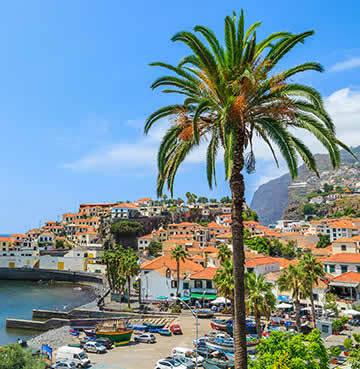 Funchal's Old Town is jam-packed with picture-perfect cobbled streets and old iconic buildings. Take a ride on the wild side in a wicker toboggan and whiz down the mountain side like the locals. Unspoiled and relatively untouched, the spectacular Silver coast stretches between Porto and Portugal's capital, Lisbon. Away from the buzz of the Algarve, you'll most likely have the beach to yourself here. Horizons and skies go on forever in a blur of boundless beauty. White sands stretch out for miles, with a stiff sea breeze whipping the waves into action for the surf crowd. Watersports enthusiasts come from far and wide to catch this ride! A treasury of gorgeous historic towns and hidden hamlets are just waiting to be discovered. Spend the afternoon at the UNESCO World Heritage Site of Obidos. Walk the medieval walls and wander the maze of cobbled streets. The main hub, Rua Direita, is lined with shops and cafés – perfect for a spot of souvenir hunting and people watching. The Silver Coast is a go-to getaway for lovers of the great outdoors. Long walks on blissful beaches, bike rides across craggy clifftops, horse riding through luscious countryside, and surfing the wild Atlantic – there's countless ways to experience the natural beauty of the area. Don't forget there's plenty of world-class golf courses to take a swing at too! Nestled in Portugal's northwest, Costa Verde is the epitome of escapism. Affectionately called the 'Emerald Coast', the region does exactly what it says on the tin. Small towns, sandy beaches, pine-scented forests and verdant valleys are overlooked by a mesmerising mountain backdrop. Outdoor enthusiasts are sure to feel they've won the location lottery with this Portuguese paradise! 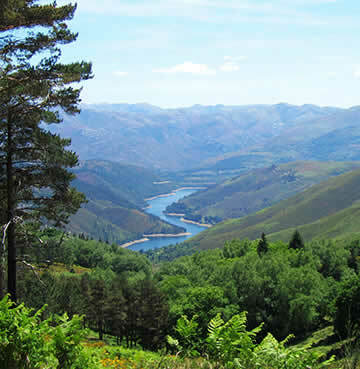 Picturesque Peneda-Gerês National Park is rife with rugged hiking and climbing routes. They say nature soothes the soul, so what better time to get out and enjoy it? Your efforts will be rewarded with wonderful waterfalls, jaw-dropping viewpoints and even a little thermal town! Thick woodland shelters wild horses, deer, otters, badgers, boars and wolves – although they're all very good and keeping to themselves. For a slice of authentic Portuguese life, wander through the old villages that are scattered across the region. Delightfully understated and unhurried, the dreamy landscapes of Douro Valley are a wonderful way to spend your holiday in Portugal. Carefully crafted vine terraces line the banks of the Douro River and wind their way up the valley slopes – a breathtaking site to behold! Whether you're a wine connoisseur or just partial to the occasional glass or two, you'll soon fall in love with the region's calibre of blends. There's countless wineries to tour and explore, and depending what time of year you decide to visit – you might even get to see how they're harvested. Set sail on the river for a relaxing, romantic day out. Take a private yacht or friendly ferry ride through the bountiful natural beauty. As you drift down the Douro, you'll have one of the best views in the house – so grab a chair and sun yourself on the deck. A little further afield lies the atmospheric Porto. Perfect day trip potential, explore the picturesque place at your own pace. Teeming with buzzing bars, boutique shops and culture vulture must-sees – the Old Town is the heart of Portugal's second city. The restorative, salt-tinged air sweeping the Silver Coast is a perfect remedy for couple's chasing rest and relaxation. Families can enjoy beach day after beach day on the Algarve's golden shores, with every kind of imaginable facility at their fingertips. Between holiday hotspots and off-the-beaten-path beauties, Portugal's beaches are 100 kinds of beautiful. With more than enough sand to go around, it's safe to say there's a bay to indulge every whim. So if your seashore needs change as often as the tides, you'll find yourself well catered for with swanky marinas, shimmering sands, seductive shores and blissful solitude. Atlantic waves lap gently in the south and crash wildly in the west. Perfect for little paddlers and surf crowds alike. Blue Flags fly proudly, cliffs tower over quiet coves, sunsets are some of the most spellbinding on the continent and resisting the region's rugged charm is virtually impossible. Finding your favourite beach of all time might just be a shore thing! Tuck in to traditional treats and beloved Portuguese eats, from Costa Verde's tasty goat stew to the Algarve's delicious fish dishes. Locals take pride in simple and flavourful culinary creations, with sun-loved ingredients farmed fresh from fertile valleys. Thanks to the miles of captivating coastline, seafood makes regular menu appearances. Pork is particularly loved too – which just goes to show there's far more to Portugal than Peri-Peri! Carbaholics are well catered for, with bread, rice and pastries all being Portuguese staples. 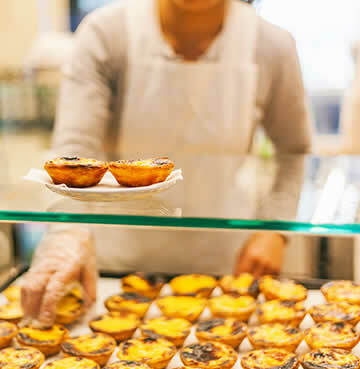 Famous sweet treat exports like Madeira cake and Lisbon's Pastéis de nata (custard tarts) are unmissable. The latter, an egg tart pastry with a dusting of cinnamon, will beckon you over from every bakery window with their glistening caramelized goodness. The majority of Portuguese locals still head to traditional shops and markets for their everyday bits and bobs. Minimercados (mini markets) are your best bet in small villages and towns, where the store is roughly the size of someone's front living room. Lively markets are a regular affair in larger towns, while smaller towns hold one or two a week. You'll be able to hunt down fresh food produce, clothes, shoes, ceramics, baskets, toys and anything else you can think of! Ceramics are Portuguese souvenir royalty, and make for a one-of-a-kind keepsake or gorgeous gift for someone you love. Choose between traditional azulejo tiles, fantastical figurines, pretty pottery pieces and cookware creations. Hand-stitched tapestries, woven rugs, lovely linen and lace embroidered bedspreads make marvellous mementos too. Lisbon, Porto and the Algarve have stunning shopping complexes a stone's throw from town centres. Perfect for families, there's plenty to get up to! From perusing high street brands you love, to catching the latest releases at the cinema or indulging in a healthy helping of family competition at ten-pin bowling. For the unbeatable feeling of freedom, head off on an adventure with a holiday hire car. Fall head over heels for coastal roads and verdant valleys, and make the most of Portugal's stunning scenery and dramatic diversity. Journey through luscious landscapes and discover all the lesser known hidden spots and best kept secrets. Cruise along the Silver Coast and stop off when it takes your fancy. Feel the wind in your hair as you drive the Algarve's captivating coastline. 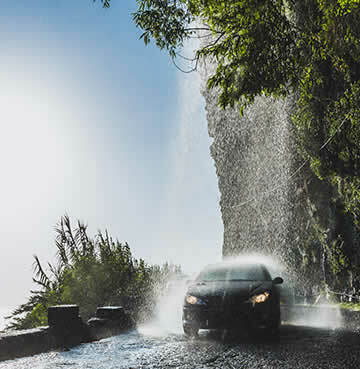 Take on Madeira's magical mountain roads and soar above the clouds or drive under wonderful waterfalls! Whether it's unmissable historic towns, natural attractions, wine routes or remote rural gems – driving in Portugal puts you in the heart of the action. For more road trip inspiration, take a look at our blog for adventures in the Algarve!